Polyurethane coatings were invented in the mid-20th century. Plastic resins in liquid form, they are used primarily to protect wood surfaces. Their main ingredients include acids derived from vegetable oil, nitrogen-based chemical amalgams, isocyanates, and mineral spirits. Nitrogen helps keep polyurethane finishes from chipping, isocyanates make them hardier in general, and mineral spirits constitute the base that supports the other components. A polyurethane coating cures when some of its chemical elements form powerful links with one another after reacting with atmospheric oxygen. These links allow the finish to resist damage due to external factors. 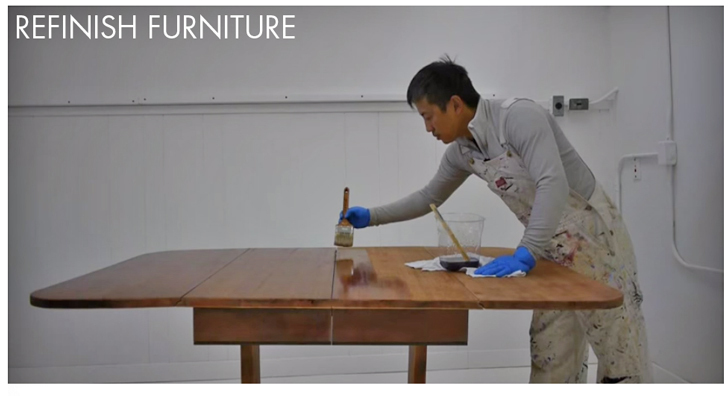 In contrast, lacquer does not stand up well to strong chemical agents. However, polyurethane is prone to eventual discoloration, and its application may make light woods darker. Ecological awareness has prompted several finish manufacturers to make water-based polyurethane products. The basic formulation calls for the suspension of polyurethane in water. Although these coatings are more vulnerable to wear and tear than traditional, oil-based finishes, they dry rapidly, produce almost no smell, and are water washable. They also represent less of a health hazard than oil-based polyurethanes, which should only be applied in a properly ventilated area. Under no circumstances should one shake a polyurethane finish prior to applying it. Agitation creates bubbles, which may later appear on the surface being treated. Gentle stirring is the recommended way to mix polyurethane. A cloth, foam brush, or fine-bristled brush may be used to apply it to a surface. When brushing, follow the wood’s grain and get rid of every bubble you see. A day after finishing the surface in question, sand it with 320-grit sandpaper. Take care not to remove the polyurethane entirely, thus damaging the wood stain below. After the sanding process, remove the bits of material it has produced and add a second coat of finish. Uncommon shine may be achieved as follows: Sand the final layer of finish with 600-grit sandpaper, then buff it to a high gloss. If a wood surface has been stained with an oil-based product, avoid using a water-based finish. The incompatibility of oil and water is widely known, but if this combination must occur, it is essential to coarsen the wood before applying the polyurethane. (A less smooth surface is easier for water-based finish to stick to.) A thick layer of water-based finish could elevate the wood grain, so make the coats as thin as possible. The first is likely to dry within two hours or so. While sanding is not essential prior to the application of a second coat, water-based finish must be layered more times than its oil-based counterpart, which only requires two or three coats. Although the main difference is the compounds (polyurethane is basically a chain of urethane organic compounds, and urethane has a main functional group of compounds). Acrylic urethane differs from polyurethane in several noteworthy ways. 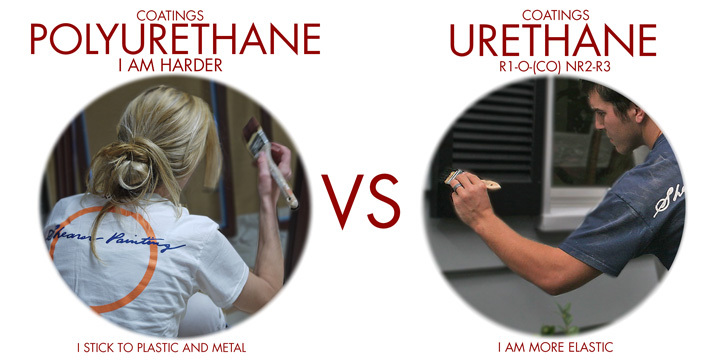 For one thing, polyurethane chips and stains less easily than acrylic urethane. It also stands up better to substances like alcohol. Some acrylic urethane coatings rival or even equal their polyurethane competitors, but generally the latter continue to earn their reputation as the stronger of the two. Furthermore, acrylic urethane coats fewer square feet per gallon than polyurethane and “sticks” less easily to surfaces. Like any coating, polyurethane finish has its downsides. It dries, sets, and cures considerably more slowly than acrylic urethane, which can dry within 10 minutes. In addition, buffing acrylic urethane to a gloss is easier than doing so with polyurethane. Both types of finish lend themselves well to spray application. However, brushing acrylic urethane is a tough job; it hardens rapidly, often producing visible brush lines. If a wall or other surface must be completely even, acrylic urethane — and polyurethane, for that matter — should be sprayed rather than brushed. Prior to finishing a surface, a contractor or homeowner may apply an epoxy primer. The primer hides imperfections that might otherwise come to light when the finish is added, especially if it produces a significant shine. The question remains: Which is better, polyurethane or acrylic urethane? As is so often the case when working with coatings, the nature of the project dictates which formulation is best. Acrylic urethane typically costs more than polyurethane, and its quality is less consistent across brands. On the other hand, polyurethane has a greater tendency to yellow in ultraviolet light. To prevent this problem, makers of pricier finishes — polyurethane and acrylic urethane alike — often add anti-yellowing substances to them.